India’s economy is thriving, and it shows. Our ship docks at Mumbai for the day and there is clear evidence of a burgeoning middle class that wasn’t even there 5 years ago when we last visited this city. There are advertisements saying “Come to Mumbai and we can guarantee you a job”. How many cities in the world can guarantee that. What they don’t mention is that they can’t offer you a place to live. Many thousands of Indians move to this city every month for the promise of work, and end up homeless because of the lack of housing. So they end up in one of the many shanty towns around Mumbai. Consequently no one is quite sure of the exact population of the City although it is known to be one of the most densely populated cities of the world. More than half of that population now live in the shanty towns or slums. His name is Deneesh. He has an easy charm spoiled by the fact that he knows it. He thinks he is God’s gift to women and is sure he will end up in Bollywood. He isn’t that good looking. He has on a trendy pair of jeans with an embroidered logo on the back pockets, and a beautifully laundered light blue shirt with the sleeves carefully folded up to the elbow. He has a ring on each finger, and a flashing smile. He looks great until closer inspection reveals severe fraying of the shirt collar, and poor teeth. It is the perfect symbol of India where everything looks better from a distance. He is taking us to the largest slum in Dubai, called Dharavi. His company is very involved with helping the people of the slums and with the money they make from doing these tours they have built schools for the children and training facilities for the young so that they can get jobs outside of the slums. It is a great program, but we wonder how the people feel about tourists coming through their streets. Deneesh tells us that at first there was a lot of resentment towards these wealthy people , particularly because they looked so clean as they picked their way through the filthy streets. 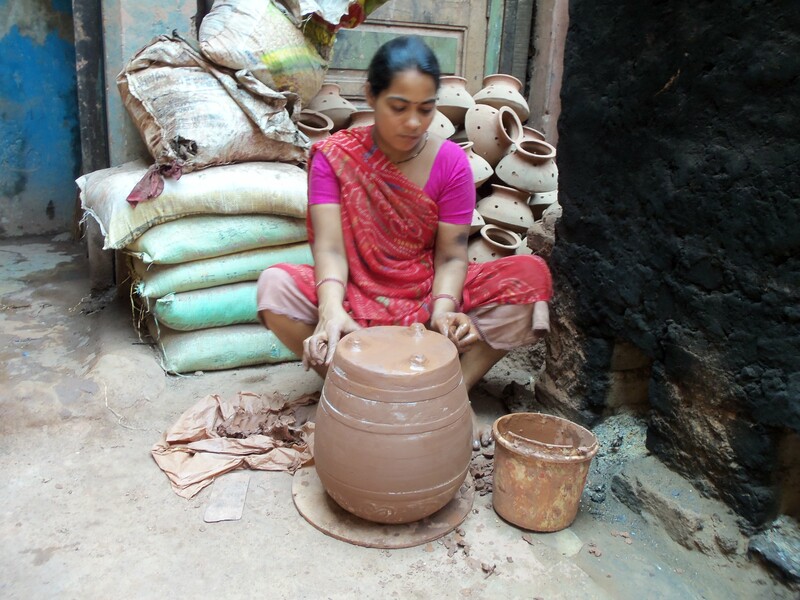 But with the help of Reality Tours the people of Dharavi have gradually accepted that the tourists are there because they are genuine in their interest to see the lives of the people. However Deneesh warns us that we will be shocked at what we see and even more shocked at what we smell and out of respect we should at no time show that shock or revulsion on our faces. He asks that we also show our respect by not taking any photographs. There are other businesses in the slums also, and we see places dyeing and hand stamping fabric, an aluminum smelter and potters. Deneesh then takes us across a street to the residential area. This is where the squalor of the slums really becomes apparent. Here the streets are replaced by alleyways that are so narrow your shoulders often scrape the walls on either side. They are bustling with people making their way to where ever they have to go. Passing is almost impossible and you have to step into a doorway to let someone get by you. Deneesh tells us not to stop as doing so brings the place to a standstill, because no one can get by. But he needn’t have worried , we have no desire to stop. The alleyways are paved with concrete and have a gully on one side or down the middle. When it runs down the middle you have to walk with one foot on either side. The gully is about 6 inches wide and 6 inches deep. It is where the inhabitants get rid of any waste they have from their tiny room. Basically it is an open sewer. On either side of the alleyway are the homes of the inhabitants. The home is one room 10 ft by 7 ft and is only 7ft high. The walls and the floor are concrete and the ceiling corrugated metal. The corrugated metal hangs over the alley to give the homes protection from the rain. It also almost encloses the alleyway making it extremely claustrophobic. . The doorway is narrow and less than 6ft tall. Many of them don’t have actual doors, just curtains. The doorway has a built up threshold to prevent any of the mess in the alleyway getting into the home. Often this threshold will have a couple of tiny kids looking over it into the alley. An entire family lives in this one tiny room with no ventilation other than the door. If there are more than a couple of people living in this room, there is no room for furniture so almost all of them have nothing inside. Everyone eats sleeps and sits on the floor. There are two small gas burners on the back wall for cooking powered by a gas canister. The pots hang from nails in the wall. A light bulb hangs from the ceiling. There is a large open water container standing about 4 ft tall in one corner. There is no running water, no toilet, no shower. A large plastic bucket serves as the sink for washing people, clothes and dishes. Despite this, the huge majority of people we see are carefully turned out in clean and well pressed clothes just like Deneesh. These little 10×7 rooms have no windows because they are just built in continuous rows along the alleys. There is often a second room on top of the ground floor accessible by a wooden ladder. This is an entirely separate room for another family. Often this room will have a tiny metal balcony sticking out over the alleyway, again covered by corrugated metal, making the alleyway even more claustrophobic. Every so often the alleyways will open up onto an open space designed as a recreation area but used as a dumping ground for all the waste from the homes. 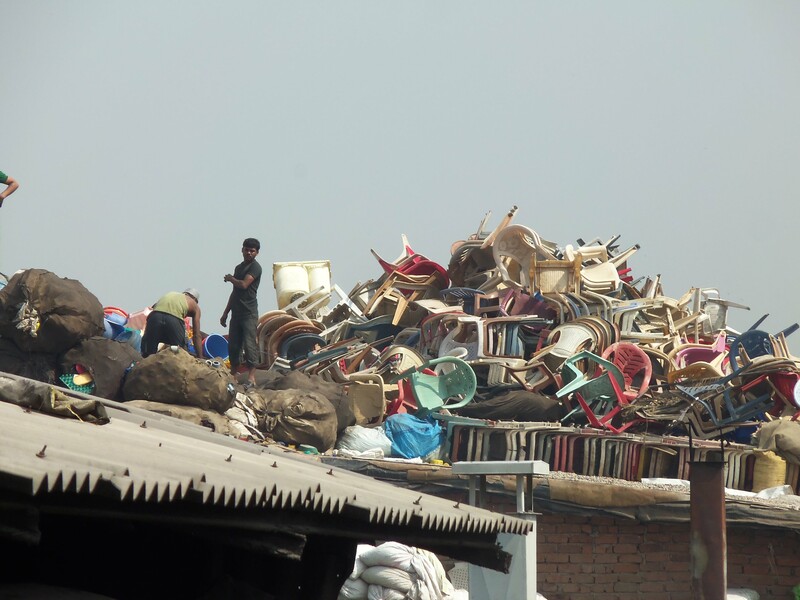 It is piled high with garbage and filth and flies are everywhere. The children play on top of all of this. Each open space will have a little building housing four mens toilets and four womens toilets. 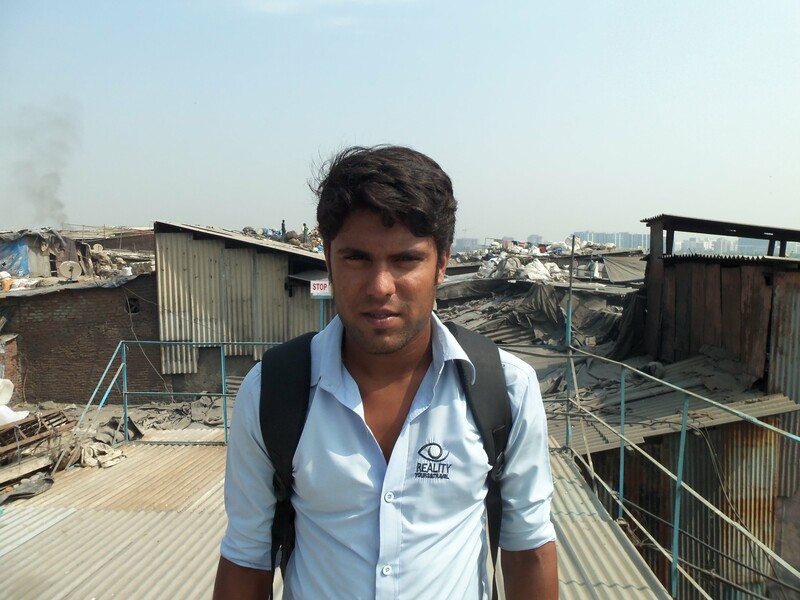 Deneesh tells us that about 70% of the population use the toilets, the rest defecate in the streets or in this open space. He explains that in the mornings the lines for the toilets can stretch for hundreds of yards. There are often a few tiny shops around the open space selling basic necessities. One such place is a tea shop. A rather glamorous name for a young man in T shirt and jeans standing behind a wooden counter with a gas ring and a kettle. A few small plastic cups line the counter and a tray holds half a dozen pastries which are already being enjoyed by the flies. Deneesh asks us if we would like to stop for tea. We decline as politely as we can. Further on we see a woman sitting on a stool with several people standing in front of her. There is an enormous swarm of flies around all of them. Deneesh tells us it is the local fish market. When we get closer we see that she has a pile of small fish on a wooden plank supported by two upturned buckets. Next to her is another bucket full of shrimp. The flies are swarming over everything, but the customers are seemingly unconcerned as they wait for her to fillet their order. 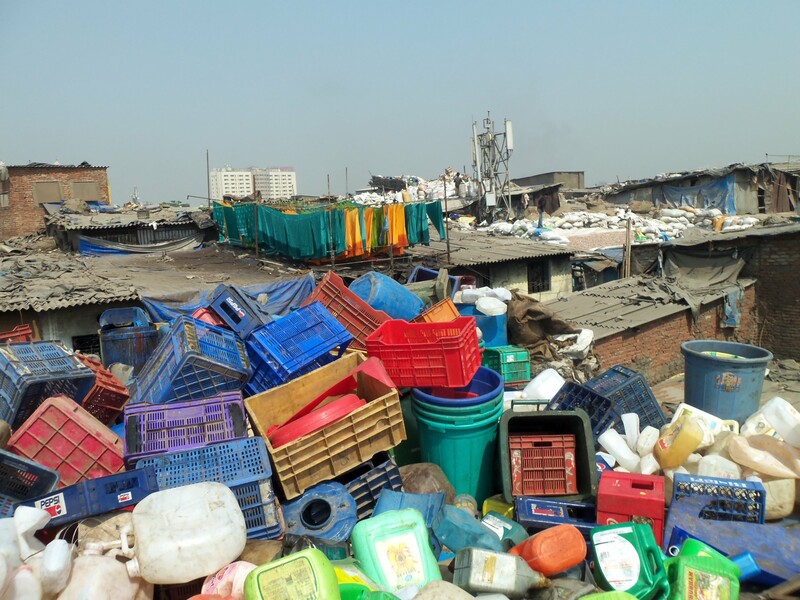 The Dharavi slum covers 1.7 square miles and houses an unbelievable one million people in some of the most depressing and filthy circumstances we have ever seen. But the amazing human spirit shines through. We never feel unwelcome and are often greeted by smiling faces. The children and the young men in particular want to stop and practice their newly learned English by greeting us with the words “Hi. How are you?”, and seem delighted when we answer them. Even more amazing is that Deneesh started the tour by telling us that we don’t have to worry about pickpockets or thieves. We have spent three hours in Dharavi and have not seen one beggar. No one has tried to sell us anything, and no one has followed us patting our pockets or asking for money. All those things are a constant headache on the city streets of Mumbai but here in the slums the people have more pride. But much as our eyes have been opened, our pores have been clogged and we need nothing more than a long hot shower. And in one last show of respect to the people of the slums, I will not show a passenger of the week this time. This entry was posted in Dharavi Slum, Mumbai. Bookmark the permalink. Thank you for sharing this with us. We often forget how privileged we are until we are reminded of how others live. Wow. Nothing else. Simply “Wow”. Gives me another visual for when I am running around NYC, feeling that all of life revolves around me – think again!